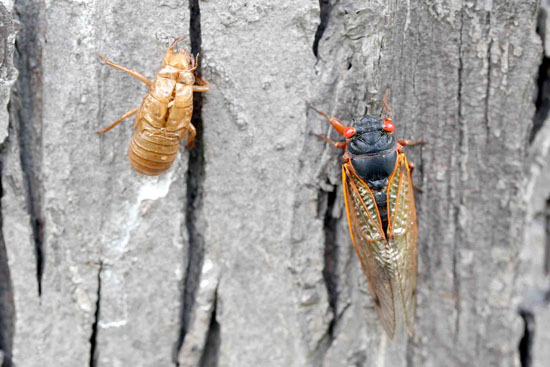 Periodical cicadas should be emerging in northwestern Illinois. This is the Iowa brood, also known as Marlatt's Brood III, that covers most of the southern two-thirds of Iowa. It extends into Illinois, being present in Henderson, Warren, Knox, Fulton, and Schuyler counties. It has a disjunct area in northern DeWitt, and northwestern Champaign counties. Periodical cicada and nymphal skin on trunk. Both sexes of cicadas will be present for 2 to 3 weeks, with the males dying by mid-June. Only the males sing, so that will stop by that time. While the males are singing is a good time to check your clientele areas to determine whether small trees need to be protected. Periodical cicadas expand their range by only about one-half mile at each emergence; and egg-laying is heavier where the cicadas are more numerous, that is, where the male singing is louder. Based on previous experience, egg-laying will be heavy within 1/8 mile of heavy infestations and dwindle to almost nothing 1/2 mile away. Although a few eggs will be laid before the males die, most egg-laying occurs from mid-June through mid- to late July. As a result, while the males are singing is the best time to protect young trees from egg-laying damage. The female cicadas use ovipositors (egg-laying devices) to slit twigs and insert eggs. Most attacked twigs are about 1/4 inch (pencil-sized) in diameter, but eggs can be laid in branches up to about 2-1/2 inches in diameter. 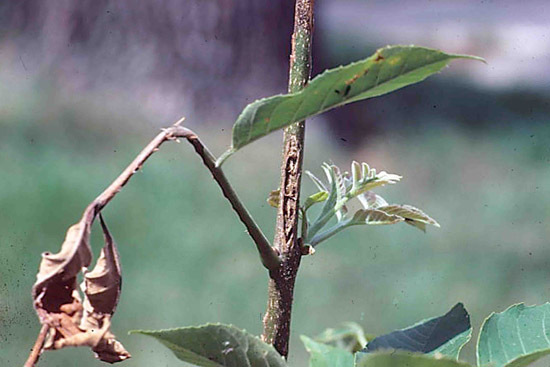 This egg-laying damage weakens the stems, making them susceptible to breaking by high winds. Broken branches will be replaced by new branches, but broken trunks will not. Broken stems of shrubs will be replaced by the root system. Periodical cicada egg-laying damage on twigs. Protect trunks of young trees with cheesecloth, shade cloth, nylon screening, or other flexible mesh that keeps the female cicadas from laying eggs. This protection should extend from the soil line to the first branches. Tie it at the top and bottom to keep cicadas from getting under the mesh. Ties along the trunk may also be needed if there are openings where cicadas could enter.